A friend sent this photograph last evening and I just loved it! I used to go to bed at night, letting my mind wander all over the place until I finally fell into a restless, fitful sleep. In those days, I always woke up still feeling tired. Sleep was necessary, but not refreshing or renewing. The more I began to focus my mind, especially right before I fell asleep, on good thoughts, the better I felt in the morning. Then I started to notice that important thoughts; new ideas and solutions to issues that I had been wrestling with, were almost being “presented” to me while I slept. It’s odd that this part of us, the need for sleep, is looked upon by so many as a necessary evil. If we can’t figure out why we need the amount of sleep that seems to be right for us individually, then we somehow label it a weakness. I’ve heard people say with pride that they only needed 4 hours of sleep a night. As if the more hours we stay awake and alert, the better we are. Something very important happens during sleep…some connection that is vital to our well-being in a way that is beyond scientific, rational explanation. But to reap the benefits, we need to drop the worries and concerns of the day and turn our selves over to the great healing and renewing power that is waiting for us, just below our conscious minds. I’m going to think about these four blissful dogs when I “lay me down to sleep” tonight. …once in my own despair i dreamed a voice that said, “touch sun.” after the dream, every day, wherever i went, i put my back, or the sole of my foot, or my palm on the suncats–the rectangles of sunlight–on walls, floors and doors. i leaned and rested on those golden shapes. they acted as a turbine to my spirit. i cannot say how, only that it was so. 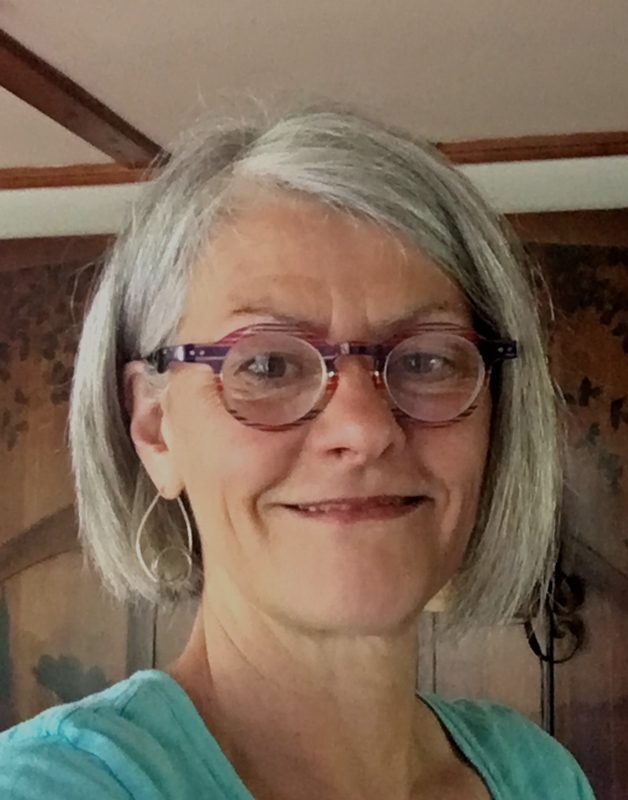 women who run with the wolves–clarissa pinkola estes, ph.d. Thanks, Virginia,for a reminder of this very wonderful book! It was (and is) superb and way ahead of its time. How precious the photo is along with your inspiration at the end. We learn so many things from animals. I am so happy to have found your blog, thanks to Jon Katz’ blog. I just love his photos/stories about the animals as well. I have forwarded both blogs to my daughters and neighbor and they thank me for them. Thanks Mary for sharing that wonderful, heartwarming photo! I loved your blog and the message. Thankyou for being there for all of us who love you, your photos, your blog and your wisdom. I love the image and the thought for the day! My cat loves the sun spots too. Virginia, I love the idea of touching the sun spots! I think they give us peace and energy, perhaps that is why our critters love them too. And . . . going to bed with nurturing thoughts! Good idea. I have had many scary dreams when I have gone to bed with troublesome thoughts in my head. Thanks again Mary and WWF! The moment I saw this photo, I looked around for my dog and . . . sure enough, there she is, three feet from my chair, lying in the only two foot square block of sunlight in the room. So smart! Mary…such a great photo….dogs seeking the light. And thanks for the wonderful mental images of going to sleep with pleasant thoughts and a sincere desire for deep rest. I have been sleep-challenged lately and today’s post is a beautiful nudge to remember that how I enter the world of sleep has everything to do with how I will experience it. This is perfect! I woke up this morning feeling guilty for having slept 9 hours…My first thought being, “What a waste of time”?! Normally, I never sleep more than 7. Even though the last few days have been more stressful than usual, I still wasn’t cutting myself any slack for needing those 2 extra hours. Now I am grateful that I was actually able to get the rest my body and mind needed! I stumbled across your blog today and I’m glad I did. That photo is so heart-warming. I learn a lot from my dog, whose curled up asleep at my feet right now. The photo is such a good example of what we can learn from our animal friends—they sleep the sleep of the innocent, the blessed, the serene, the very best of life. One of the most pleasant things about setting my own schedule now that I am able to stay at home is the daily nap with one of my special cats. The very essence of bliss and relaxation—the nap with a cat curled up next to me. When the space was long enough, I would sometimes lay down in the sun with my dog, just for fun. She would glance at me as I did it and then just go into a ‘sun nap’ and forget about my being there. Sooner or later, though, she would shift position, see that I was there and come lick my nose. Great memories. Thanks, Mary. Thank you Mary for the great photo and message! Every morning, just minutes before the alarm clock chimes, our sweet dog, Zoey, leaves ‘her’ bed and comes to my husband’s side of the bed and gently nudges his arm—as if to say “Okay, up with you; now it’s my turn.” The moment his feet hit the floor, she jumps up in his warm spot and snuggles with me until we wake gently, hours later. It’s the best way to start the day!! How I love this quote Mary, “I have been dipped again in God”! and to see those precious pups basking in the sun! As for sleep – remember when we were mothers of young children and going to bed was a really important part of the day? First the warm bath, maybe some cocoa, a story, a prayer, a cuddle and kiss, the lovely ritual of tucking them in, all safe and sound. Maybe if we took time to savor the process of preparing for sleep, we’d sleep even better. Today’s Abraham message was profound for me, – I’ll share it here. It’s certainly a powerful way to end the day, in appreciation. Sweet dreams tonight, one and all! I am going to do this. I usually love sleep, but never thought of me as being able to intentionally work things out in it. Thanks! 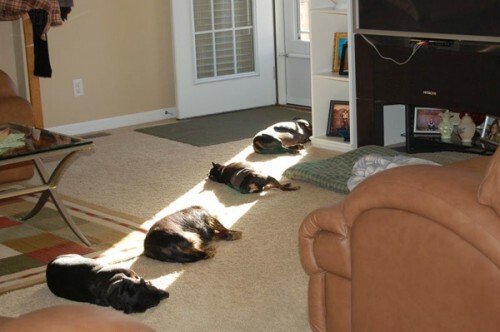 I love the picture of the 4 dogs all in a row basking in the sun. And the quote, “dipped again in God, and new-created”. Thanks . Mary Rita. That photo of the sweet pets being dipped in God’s sunshine is heartwarming. I’ve always been a night owl and when finally asleep it can be for too many hours than I want to divulge here! I read your post a while back which began with you napping, and it felt comforting to hear. It helped me not to feel guilty for a long night’s sleep or an occasional nap. I used to self depricate and feel ashamed around my sleep issues. Not any more! Life’s to short! Thanks again for a great piece Mary. Wonderful post Mary, I want always to be dipped in God! Sweet photo. Whew! I spent the last two days figuring out a tech snafu that kicked me off Mary’s blog. I finally had to re subscribe. It was a tense moment or two! White Feather Farm is my crack! Love to all and thank you Mary for your insight. Terri, ME TOO! I would hit post and be told immediately that my email address needed to log in. . . Fortunately for un-tech-savvy me I had a date with my son today who got me all signed in within minutes, worked his magic, which at least it seemed to me, and I’m still not sure what happened. But I too, panicked, WFF-less for a day? No way! This happened to me too, Terri. When I went into the “confirm” email, it told me that my subscription had run out. Then I went back into Mary’s website and posted a comment to someone else, and the next email for confirming worked. I’m so tech-ignorant, that when something clears itself, I’m astounded and I celebrate! I love to sleep, and I don’t feel quite right when I can’t sleep and dream for at least 7 to 8 hours every night. Our dogs sleep on our bed, and snuggle like puppies with us all night. They both also love to have a nap in a patch of sunshine whenever possible. Dogs just know how to love the best stuff! When I sit in the Sun in the afternoon, I almost go to a different place. It makes me want to purrrrr. It is charging my batteries! It is healing. Mary, this speaks to me of peace…I love it…”to be dipped in God”,, gives me goose-bumps!!! A wonderful picture! I love it when there are dogs strewn all over the floor (we have three dogs and two cats, so we get scenes like that occasionally.) Good sleep is a blessing, for sure. Thank you.